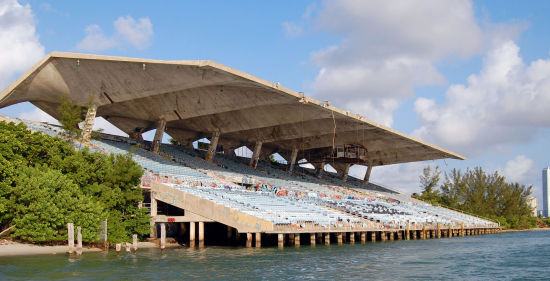 After decades of abandonment, the historic Miami Marine Stadium is set to get a new lease on life. 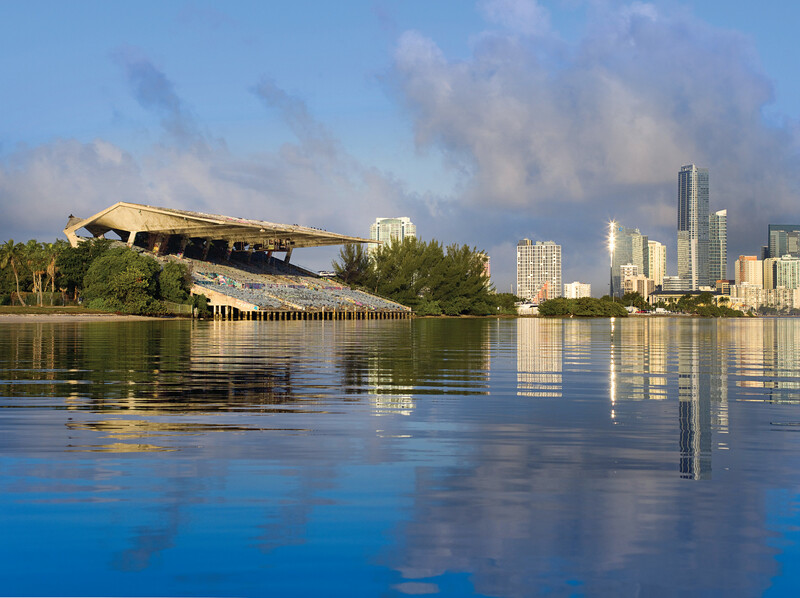 The City of Miami declared it will borrow up to $45 million to preserve the stadium, an open-air venue for boat races on Biscayne Bay designed by architect Hilario Candela and completed in 1963. The cantilevered concrete structure was severely damaged by Hurricane Andrew in 1992 and left to decay. Over the years, efforts to preserve the stadium have come in cycles. Two years ago, a local group floated the idea of stadium-saving murals, and earlier this year the National Trust for Historic Preservation teamed up with Dade Heritage Trust to revive the structure, which is now covered in graffiti. That crowdfunding campaign raised over $110,000 for the stadium's preservation. Most recently, this November Miami commissioners approved a $37 million restoration as well as the construction of a new 35,000-square-foot maritime center adjacent to the stadium. The project will be paid for by yet-to-be-issued special obligation bonds. 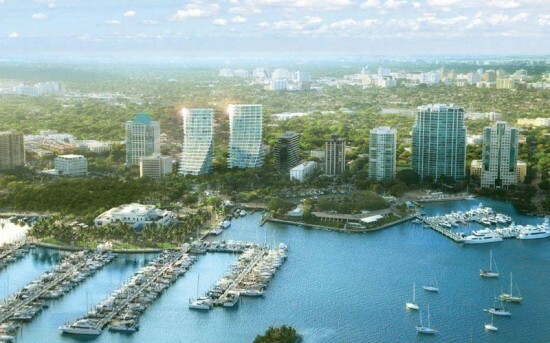 The renovations and new construction are part of a city plan to revive Virginia Key, the publicly-owned barrier island that is home to oceanography research labs and the Miami Seaquarium, among other attractions. The park and basin surrounding the stadium is the site of the Miami International Boat Show, an annual trade convention for recreational boaters. The financial approval is a big step forward for the stadium, but it's not its last hurdle. The city is still figuring out whether it will hire a private firm to run the venue, and its contract negotiations with architect Richard Heisenbottle are ongoing. Regardless, preservationists are counting the announcement as a strong win. “This is a great day for Miami Marine Stadium and for the millions of people in South Florida who love this important place,” Stephanie Meeks, president of the National Trust for Historic Preservation, told the Miami Herald. The vote, Meeks said, "represents the critical financial commitment needed to bring the stadium back to life as the focal point of Virginia Key.” As many municipalities tighten their budgets, preservationists and citizen-builders are turning to crowdfunding to generate publicity and financial backing for seemingly quixotic projects. In April New York–based artist and designer Nancy Nowacek raised over $25,000 for a bridge to link Red Hook and Governors Island, while plans are underway in Baltimore to build a monument to Divine, the character immortalized in John Waters's 1972 film, Pink Flamingos. An abandoned, decaying Miami stadium that once hosted the likes of Gloria Estefan, Elvis Presley, and Richard Nixon may finally be coming back to life. Since AN visited the 6,566-seat Marine Stadium last year there is new momentum to revitalize the iconic venue. And just as graffiti symbolized the stadium's decline, street art could help secure its future. 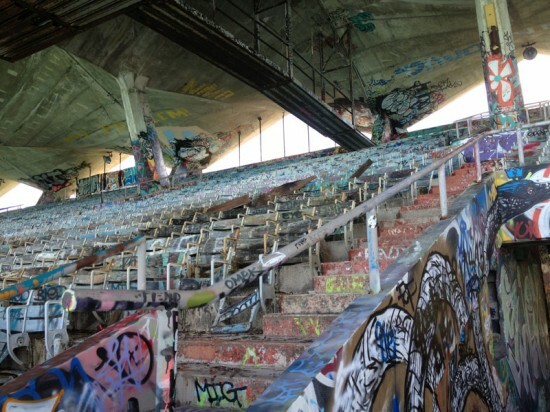 PBS reported that Friends of Miami Marine Stadium—the group advocating for the 60s-era venue—invited 20 street artists from around the world to cover the space in murals. Why exactly? Well, the organization is now selling prints of those murals to draw attention to the building and raise cash for its transformation. And it turns out that initiative is strongly supported by the stadium's original architect—Hilario Candela. The revenue from those pieces, though, will likely only represent a small piece of the $30 million that needs to be raised before January. Estefan recently helped chip away at that figure with a gift of $500,000. To get a sense of what the stadium could look like if that $30 million goal is met, check out these conceptual renderings below from architect and designer Arseni Varabyeu.